My father, who lives in Taiwan, is going to visit us in January 2018. When he first told me his travel date, we decided to spoil him for his flight. My wife and I had such a great experiencing flying Singapore Airlines Business Class that I wanted my father to share the experience. It didn’t hurt that I already had 64,500 Singapore Airlines KrisFlyer miles in my account, previously refunded for securing a waitlisted saver award. KrisFlyer miles expire after 3 years and there is no way to extend their expiration currently. As of March 23, 2017, there have been some big changes with the KrisFlyer program. There are now no more fuel charges on Singapore redemptions, which means less cash expenses when booking with points. Unfortunately, the other changes to the KrisFlyer program are negative. The 15% online booking discount is now discontinued. Also, all award-booking mileage rates have gone up. I think of this as point inflation. This is bound to happen over time as more consumers increase their credit card rewards points and airline mileage balances. Sinagpore Airlines does not have any direct business class flights from Taipei, Taiwan to Los Angeles. If we booked with Singapore Airlines, my father would have to fly from Taipei to Singapore, layover for 4.5 hours, and then fly to Incheon, Korea for a 2-hour stopover and then finally fly to Los Angeles. Total travel time would be almost 29 hours. 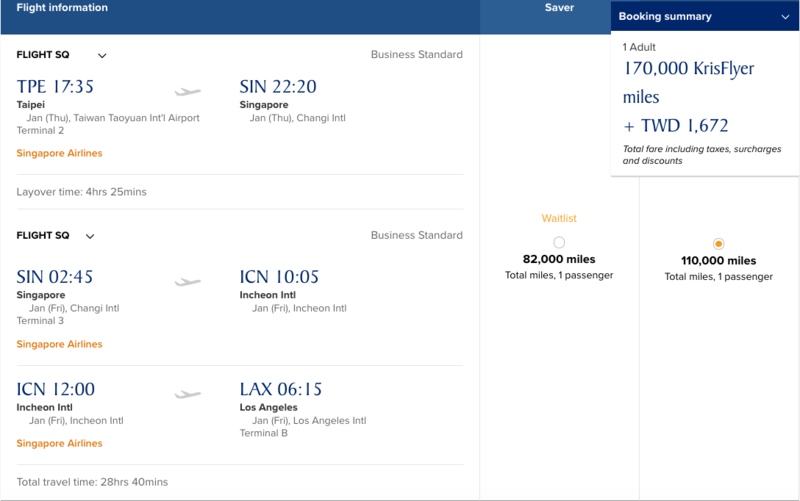 This itinerary would cost 170,000 Krisflyer miles and 1,672 Taiwan Dollars ($55.53). I decided to book my father two separate flights to save on travel time and miles. 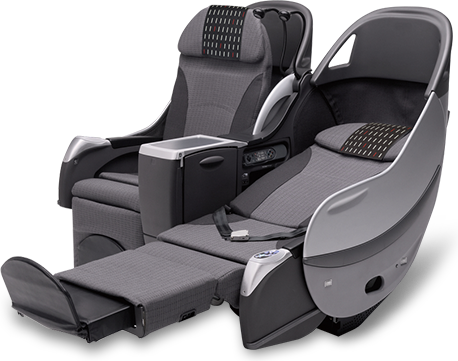 First, I found him a Business Class seat on Japan Airlines from Taipei (TPE) to Tokyo, Japan (NRT). I booked this 3-hour flight with 20,000 British Airways Avios transferred from my Chase Ultimate Rewards points balance. The points transferred instantly and I only had to pay $25.80 in taxes and fuel charges. British Airways Avios provide excellent value for short haul flights. 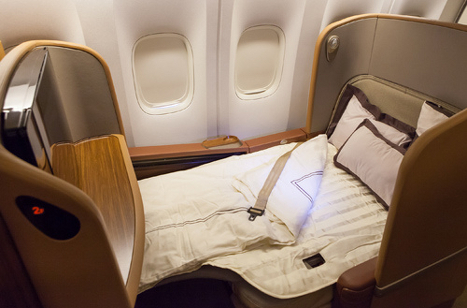 Next, I booked my father a flight from Tokyo, Japan (NRT) to Los Angeles (LAX) on Singapore Airlines Business Class. This 10-hour flight cost 115,000 KrisFlyer miles and 6,450 Japanese Yen ($58.42). To make up the difference in miles needed to book the flight (51,000 miles), I transferred 43,000 American Express Membership Rewards points and 8,000 Chase Ultimate Rewards points into my KrisFlyer account. Points transferred over within 24 hours from American Express and 48 hours from Chase. In the meanwhile, I secured a waitlist position for the same flight, at 85,000 miles. If that opens up, I’ll get 30,000 KrisFlyer miles refunded back into my account. Singapore KrisFlyer miles can be transferred from all the major credit card points currencies: Chase Ultimate Rewards, Citibank ThankYou Rewards, Starwood Preferred Guest Starpoints, and American Express Membership Rewards. If we were to book my father’s one-way flight with cash on Singapore Airlines Economy Class, his flight would have cost 26,068 Taiwan Dollars ($865.82). After factoring in the taxes and fuel charges paid ($25.80 + $58.42), we saved a conservative estimate of $781.60 for my father’s flight(s)! My father has never flown Business Class before and he is quite excited for this trip. My dad's Business Class tickets grant him access to the nice airport lounges in Taipei and Tokyo. He’ll be treated like a VIP in the sky. Since I gave him the Global Entry benefit from my Chase Sapphire Reserve credit card, he will be able to make it through airport security in a breeze. I love credit card points because I can share them with a loved one by purchasing airfare for them – with little to no cash out of my pocket. Air travel makes an excellent gift!